VAT Technical Masterclass on Wednesday 10th April! Since its introduction on 1st January 2018, VAT has transformed the way businesses are managed in the UAE. The FTA has issued guidelines and public clarifications to support companies in being in compliant with these laws and regulations. Despite of this effort and as in any other jurisdictions with VAT, there are still unclarities of interpreting and implementing the laws in the day-to-day transactions. This workshop is designed to address and give general guidance for the participants to navigate these uncertainties as well as mitigate the risk of being penalized by the FTA. 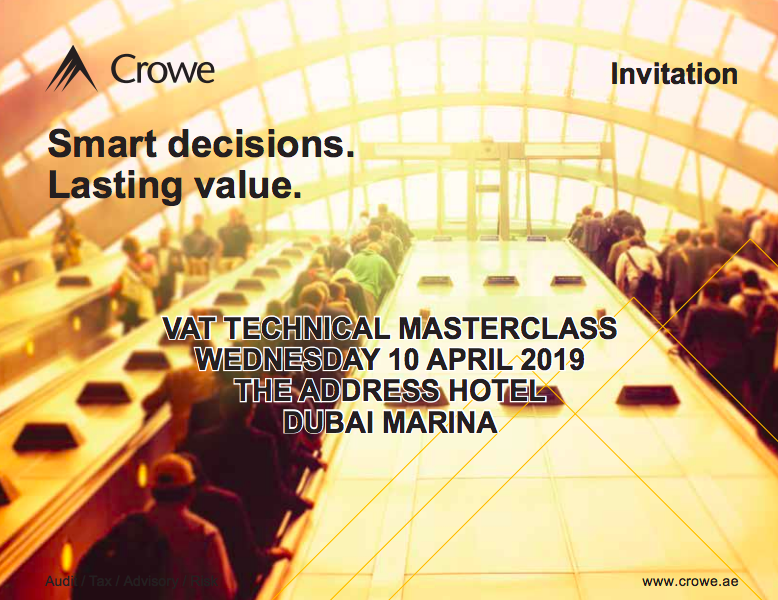 During our full day VAT Technical Masterclass, our tax specialists will give the insight of these challenges based on the real-life cases faced in various industries. This masterclass is aimed for Chief Financial Officers, Managing Directors, Directors, Managers and those charged with governance of Value Added Tax.